You meet all the best people on the Internet these days. During the last series of The Great British Bake Off a group of Aberdeen based fans of the show started meeting up on a weekly basis at each others houses to watch the programme and indulge in a cuppa, a bit of baking chat and lots of cake. Much fun was had and friendships formed. Now the Bake Off is back and this time its for Comic Relief. Again have a valid excuse to get together on a Wednesday night for hilarity and cake. This week it was my turn to be the hostess with the mostess. 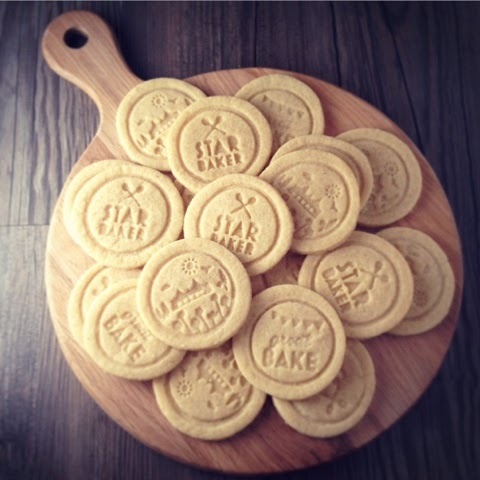 My son had received a Bake Off Cookie Set from his sister at Christmas so stamped biscuits definitely had to be made. I'd never attempted any before so put a shout out on Twitter for a recipe that would work well with them. The lovely Sisley at Sew White was among those who answered my plea and shared her Basic Vanilla Biscuits Recipe. I followed the recipe pretty much to the letter although I did it all in the food processor. Everything in at once and blitz. I would recommend working with only half of the dough at a time and keeping the other half in the fridge as it softens up very quickly. It took a few attempts to get the level of force needed for pressing the imprints quite right. Too much pressure and the dough stuck to the stamp but too little and the imprint wasn't entirely visible. Lots of flour on the stamp is a must. I cooked my biscuits for longer than the specified 8-10 minutes. Even after the 15 minutes I gave them I still felt they were a wee bit underdone when it came to eating. Once out of the oven I sprinkled them with Gingerbread Spiced Sugar. I was a bit disappointed that the pattern had disappeared rather a lot on some of the biscuits and I fully admit to picking out the best ones for the above photo. 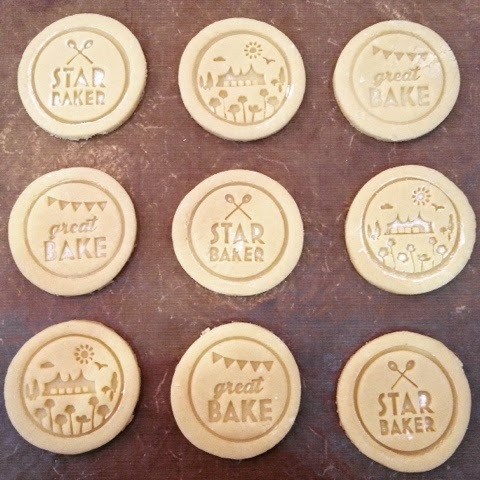 For some reason the "Great Bake" ones seemed to be the worst offenders. My second bake was a joint effort with my daughter. 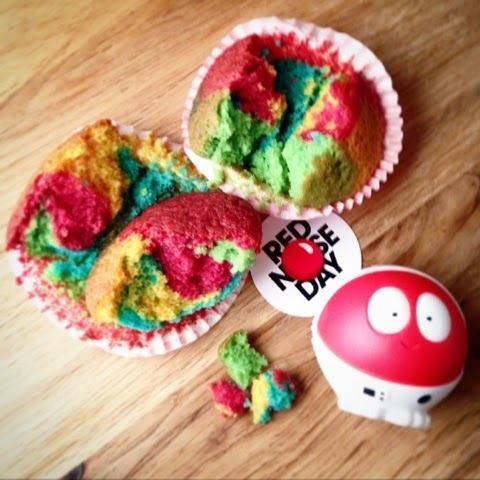 We both loved the "Somewhere Over The Rainbow" cupcakes that Abby Clancy made for the signature bake on Comic Relief GBBO Week 2. Here's our attempt at recreating them. 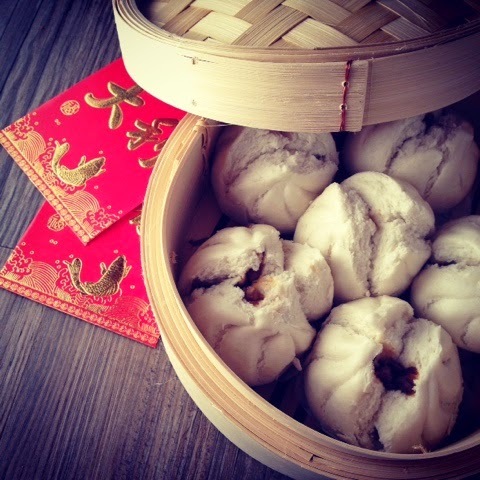 Preheat the oven to 180c Fan and prepare a 12 hole bun tin with paper cases. Cream together the butter and sugar before adding the flour, baking powder and eggs. Divide the mixture between 4 bowls and add gel food colouring to each and mix well. 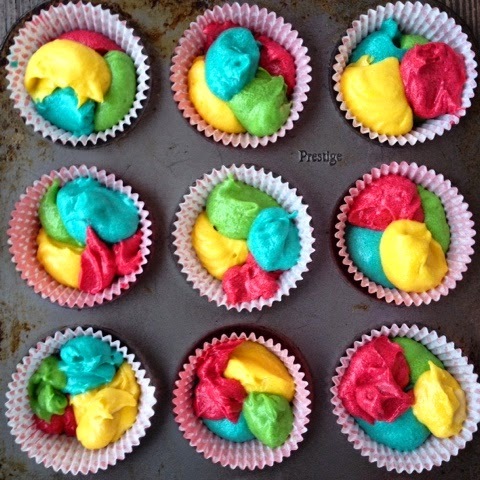 Put a teaspoonful of each colour of mix into each cake case. We were both somewhat crestfallen when our rainbow cakes came out of the oven. They had looked so fantastically vibrant when they went in but the baked colour was much more subdued. We used Dr Oetker Gel but I have since been recommended to use either Wilton or Sugarflair. 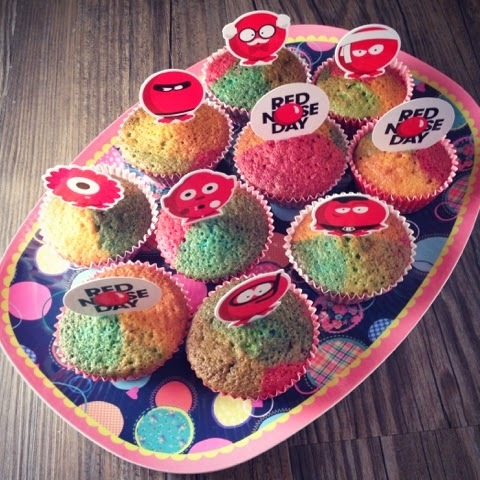 The Red Nose Day cake cases and toppers are from Sainsbury's. Once broken/bitten open the cakes were more colourful on the inside, in hindsight they would have worked better with icing or buttercream on top and a surprise rainbow interior. Look good as you cook with a Bake Off Apron, Bake like the best with a Comic Relief Recipe Book and download the Great Comic Relief Bake Off Kit with all the bits, bobs, bunting and recipes you’ll need to host a fundraising bake sale. I love the thrill of finding a real bargain in the reduced to clear section at the supermarket. I always stop for a rummage to see what goodies can be had. A mere 10p or 20p off isn't for me. I'm after a proper substantial reduction. But even then it has to be something that I will actually use. 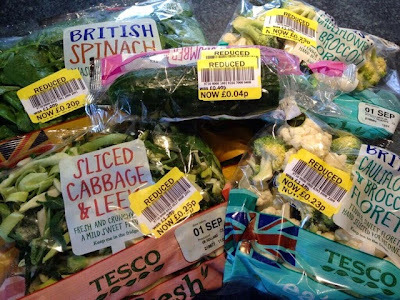 I haven't managed to work out what's the best time for price cuts, sometimes I'm lucky, sometimes I'm not. I haven't got it down to a fine art by any means. Bakery products often provide good pickings and I've got a huge chest freezer in my garage which means I can take full advantage. 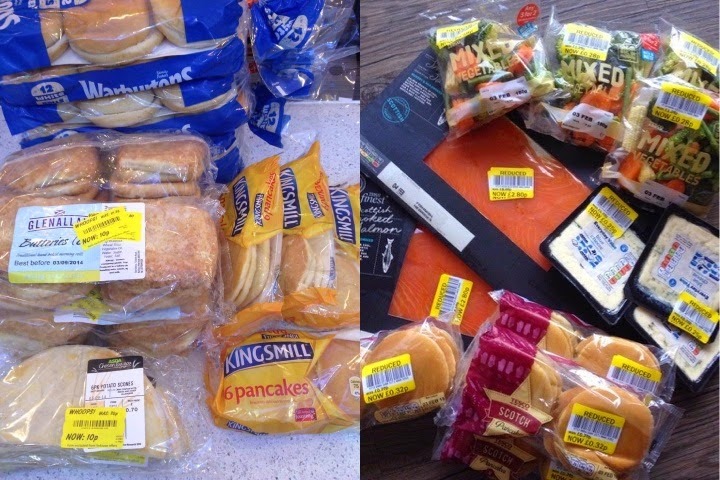 The haul below on the left cost the grand total of £1.30 for 12 tattie scones, 32 Butteries, 24 pancakes and 36 rolls. In general I'm on the lookout for something that I have a use for immediately, something that can be frozen or something that I can use to make a dish which can then be frozen or lastly fruit and veg to feed Binky & Bugsy our Guinea Pigs! It's a false economy buying something that you're not going to be able to use no matter how cheap it is. Fruit that's on the turn is great for crumbles, preserving, juicing and smoothies, prepacked and prepared veggies make very short work of soup. Chilli's go straight in the freezer and get used from frozen. Herbs can also be frozen as is, chopped up in ice cubes or made into herb butter. Most things can be frozen or turned in to something that can be frozen. Just double check the labels if there's the possibility that something may previously have been frozen. Even then not all is lost as you can cook it and then freeze it. I've got lots of bargain smoked salmon in the freezer at the moment. I split the giant packs into smaller portions and they will be perfect for sandwiches, salads, mixed through pasta and in decadent scrambled egg breakfasts. The huge ham has been earmarked to be cooked in Ginger Beer and reduced to clear "keep me" bananas soon turn yellow just like their sticker. 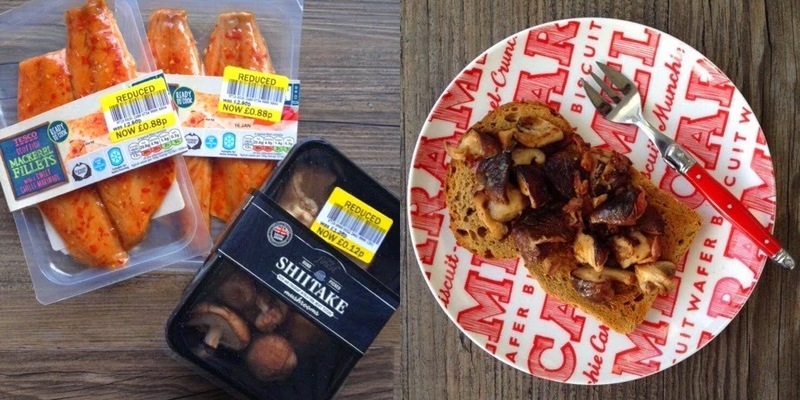 12p Shiitake Mushrooms on toast prove most palatable. 5p reduced to clear Mincemeat post Christmas was just too good a deal to turn down. It has a Best Before date of Aug '15 but I reckon it will be good years beyond that. I put out an appeal on Twitter for ideas to use it and got plenty. Mincemeat Toasties, Mincemeat Pudding, Mincemeat and Apple Strudel, Stuffed Apples, Fruit Loaf, Mincemeat & Apple Shortcake Slice and how could I forget my own Mincemeat Muffins Recipe. Masterchef finalist Brian McLeish suggested Mincemeat Bread & Butter Pudding and Keep Calm and Fanny On extolled the virtues of Fanny Craddock's Mincemeat Omelette. Clearly it is much more versatile than purely for Christmas Pies. 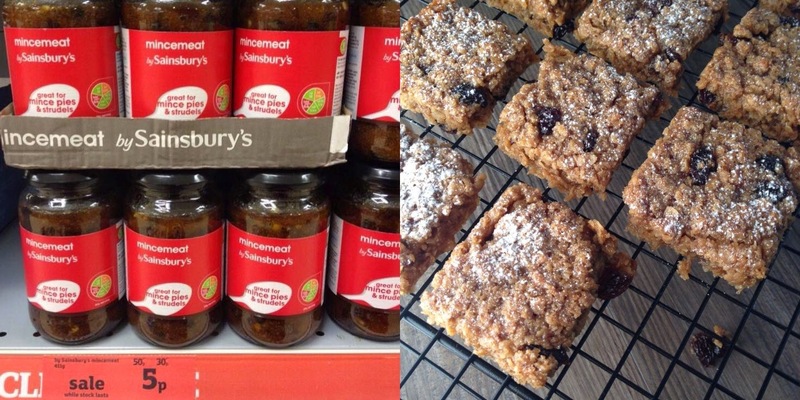 To use up half a jar I went for Dom at Belleau Kitchen's Mince Pie FlapJacks. They were gone in a flash. 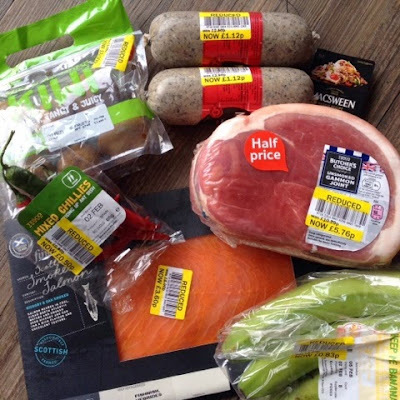 I took inspiration from Deeny's to use up one of the bargain post Burns Night Haggis from a yellow sticky haul. We are big Haggis fans and this makes a fab variation from the usual Neeps & Tatties on the side. 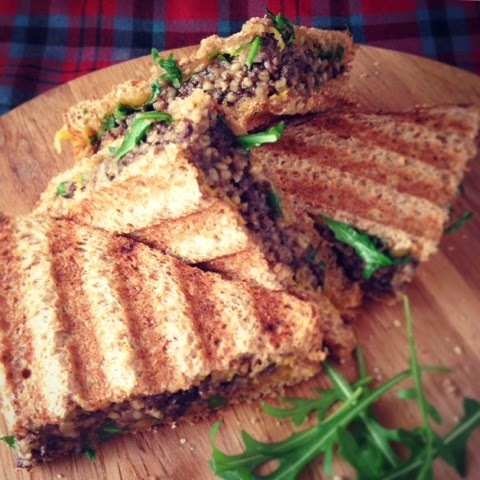 For further recipes see my Burns Night Recipe Roundup with Haggis Puddocks in the Hole, Haggis Oatcakes and Haggis Tattie Scones. These Toasties are also my entry for this month's Tea Time Treats where the theme is Toast, on Toast or Toasties. 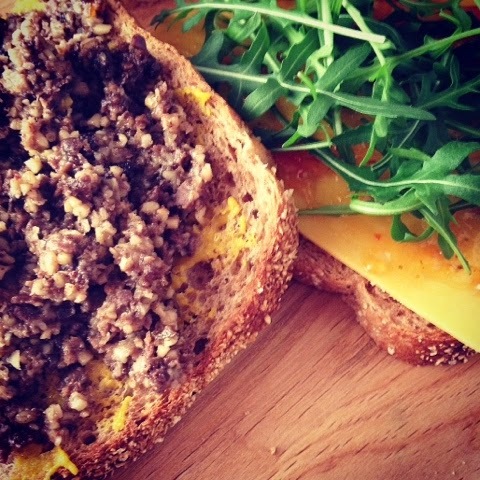 For each toastie spread one slice of bread with English mustard topped with haggis and the other with sliced cheese, chilli jam and a handful of rocket. Are you stalker of the yellow labels? 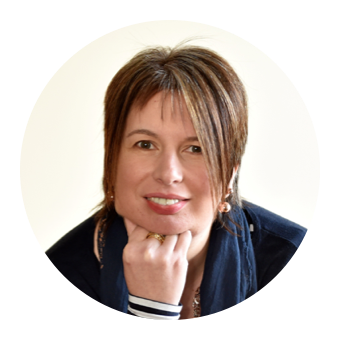 I'd love to hear about any fantastic bargains that you've bagged or any top tips regarding when to grab the best deals and how to make the most of what you find. Kung Hei Fat Choy - that's Happy New Year in Chinese. In 2015 it falls on February 19th when the year of the Sheep (goat or ram - depending on where you are in the world) kicks off. I love Chinese food, or perhaps I should say that I love what we in the west consider to be Chinese food. I'm never sure how authentic our version actually is. 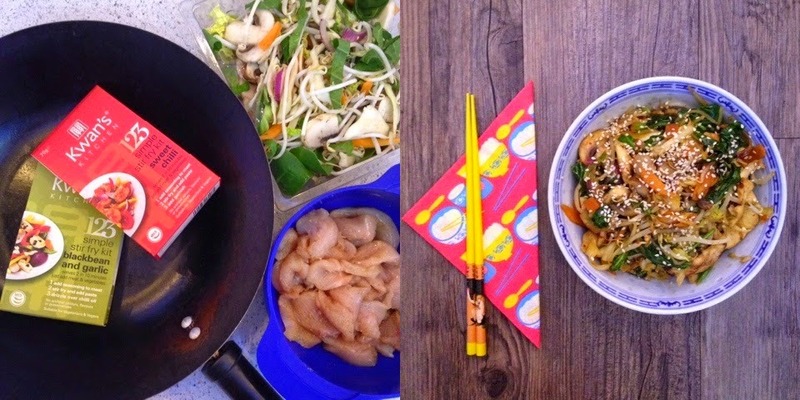 Edinburgh based Kwan's Kitchen produce a range of authentic stir fry meal kits. They specialise in restaurant quality without the use of msg, artificial flavours, colours or preservatives. I received all four of their kits to try - Sweet Chilli, Blackbean & Garlic, Aromatic Curry and Spicy Szechuan. Each kit is recommended to serve 2 although I had no problem eeking it out to serve the four of us by increasing the quantity of meat and vegetables. The 1,2,3 step process makes it all very quick and easy. Add seasoning to meat, stir fry and add paste, drizzle over oil or add garnish. I was somewhat wary of the Hot 3 Chilli warning on the Spicy Szechuan kit so passed it to a friend as I'm a bit of a woose however Stephen Kwan, MD at Kwan's Kitchen told me that I could have omitted the use of the Szechuan chilli oil just used a little at the end to customise my heat level. Useful to know. We thoroughly enjoyed both the Curry and the Sweet Chilli and following a recommendation on Instagram I'm going to try the Blackbean & Garlic with Scottish Salmon. 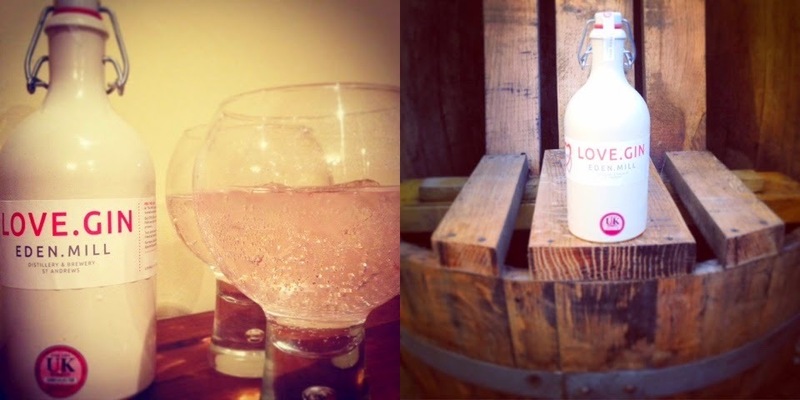 Details of stockists can be found here. Delighted to see so many close to me in Aberdeenshire. I loved the Gok Cooks Chinese series on Channel 4 a couple of years back and duly purchased the book. I've made quite a few of the recipes from it but our absolute favourite and the one I keep coming back to is Poppa Wan’s Simple Soy-Glazed Chicken. It really is simple, quick and very tasty. 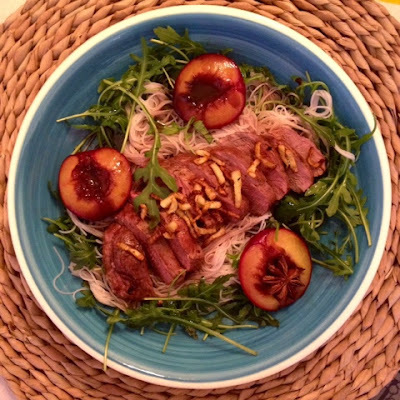 Its also just occurred to me that the Duck Breast & Plum Salad recipe I blogged last week for Valentine's Day could well be considered Chinese. 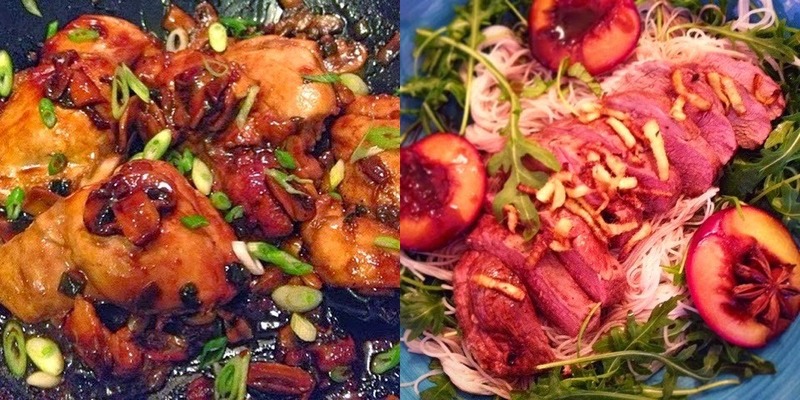 Duck, plums, star anise, ginger, noodles and soy sauce. 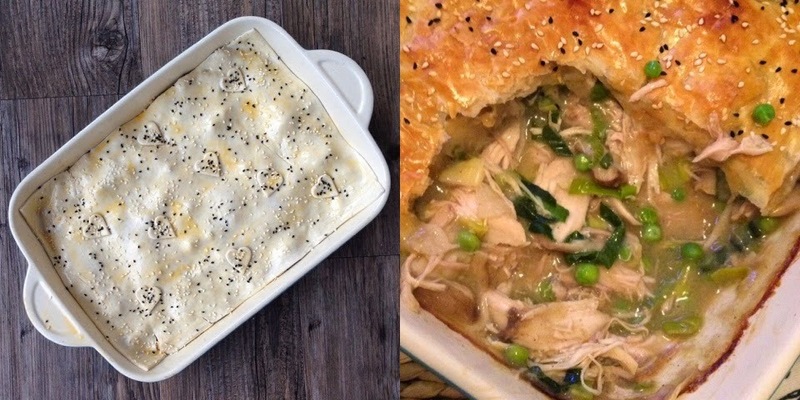 Now for one of my own, Chinese Chicken Pie. This is perfect for using up leftover chicken after a Sunday roast. Preheat your oven to 180c and grease a 1.5 litre ovenproof dish. Melt the butter in a pan, add the finely chopped leek and cook for 5 minute. Add the sliced mushrooms and ginger and cook for a further couple of minutes until the mushrooms are softened. Stir in the flour and cook for a minute before slowly adding the chicken stock, stirring all the time, until thickened. Mix through the peas and chopped cooked chicken. Season with salt and pepper and the Chinese five spice. Remove from the heat, allow to cool slightly and mix in the cream. Pour the filling into the prepared dish and top with the puff pastry, any extra pastry can be used for decoration. Brush with beaten egg and sprinkle with sesame and black onion seeds. Cook for 30-40 minutes until the filling is bubbling and pastry is golden. Lastly somewhat of a novelty item for the year of the Sheep. 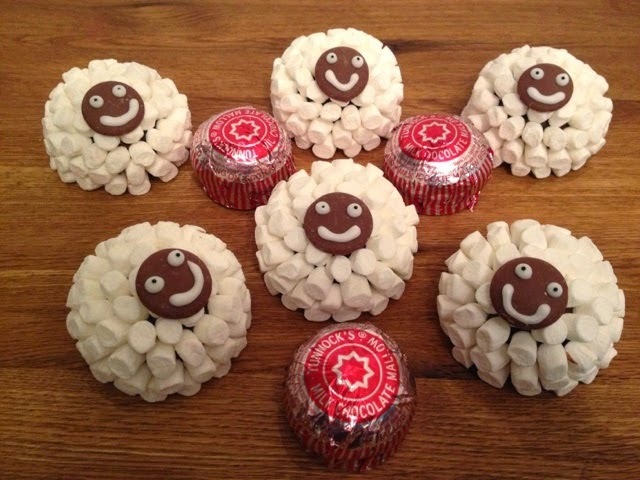 These have been re-purposed from when they were originally created for Aberdeen FC's 2014 Scottish League Cup win and will no doubt also be putting in an appearance as Easter lambs. 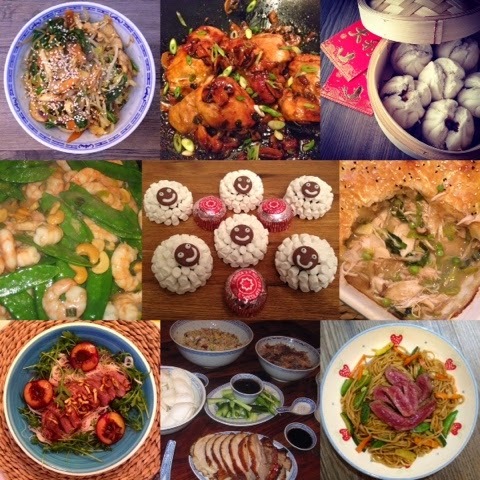 Enjoy Chinese New Year however you spend it and whatever you eat. Remember that it's traditional to ensure that your house is cleaned from top to bottom before the celebrations start. A thorough cleanse of the house will ensure that all bad luck that has gathered in the previous year is removed. I fear I may have failed on that part. However I did pay a visit to our local Chinese Supermarket last week and came back with loads of goodies, some of which I actually know what they are! Tomorrow may be somewhat of a lucky dip. 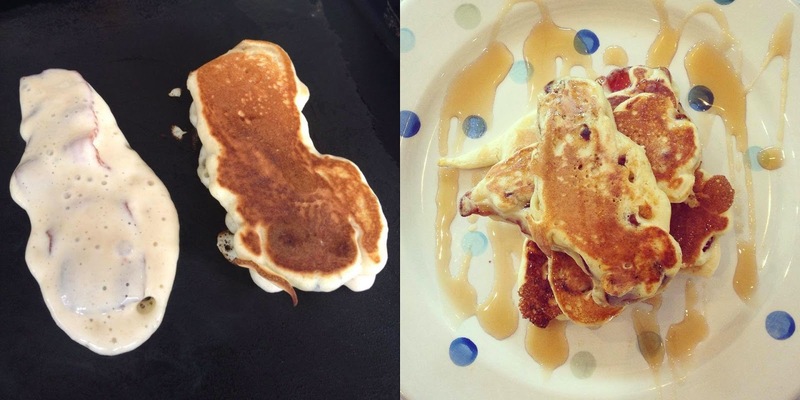 I LOVE pancakes of all shapes and sizes. I vividly recall the excitement of coming home from school to find my Mum making a batch. The special treat was always the teeny tiny final pancake made with the very last dribble of batter. Bannocks, Scotch Pancakes, Crepes, Blinis, American Pancakes, Drop Scones. Lots of different names and variations in taste, texture and proportions, way too good to save just for Shrove Tuesday. My basic pancake recipe is my Grandmothers (she of the famous Grandma Monearn's Shortbread) hence the imperial measurements. I've #SpreadTheMoose on them in the photo above. 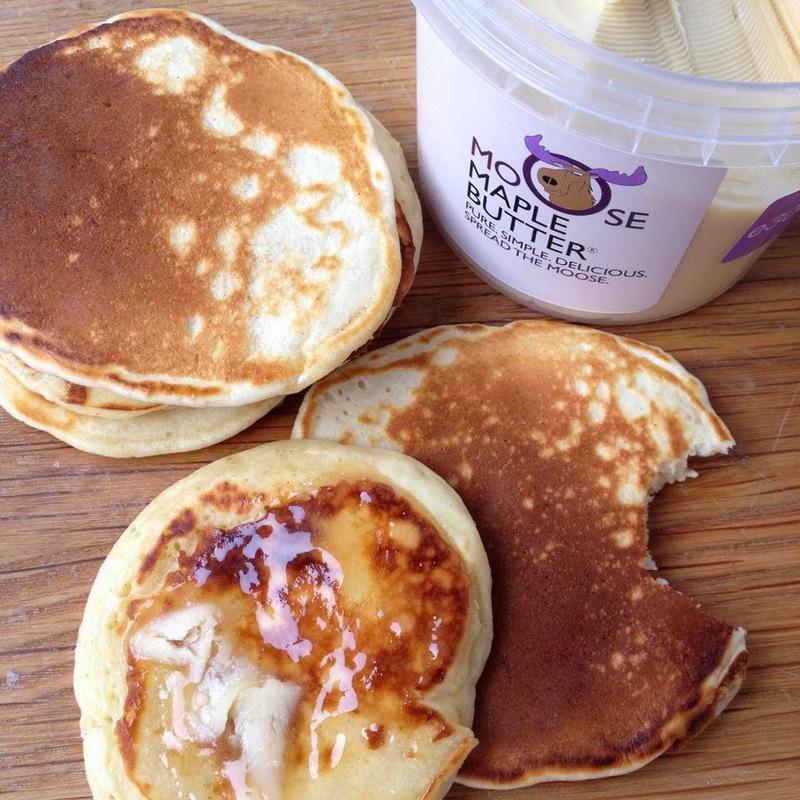 Alas Moose Maple Butter is not generally available yet but will be launching soon. Keep an eye on their Facebook Page for developments. I can confirm that it is as awesome as you would imagine it to be. The smell and taste is irresistible. Spoon on the batter to the desired size. The basic recipe above can be adapted to make the awesomeness that is Bacon IN Pancakes. These proved a huge hit when I blogged about them earlier this year as part of breakfast week. Much discussion ensued about what they could be named. Suggestions included: Bacakes, Pancon, Pigs in Pancakes, Pigs in Blancakes, Pigcakes, Hamcakes, Smoky Pancakes, Bacon Slippers and Oinkcakes. 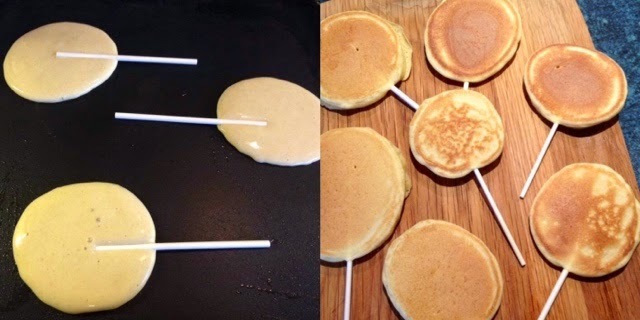 Another variation on the basic recipe is Pancake Pops. For these simply place a lolly stick on the pancake as it cooks. I'm now pondering the concept of combining both. Pigs in Pancake Pops?! A new community led food interest group has recently been set up in Aberdeen. The Mixing Bowl was launched in June 2014 but due to date clashes I only managed to get along for the first time last month. Part of the evening was a demonstration of Russian Blinis from Olga Yudina. I fully expected these to be the small buckwheat yeasted versions found in the chilled section at supermarkets for canapes. How wrong was I? They were much more crepe like in shape and size. The real trick seemed to be spreading each one with butter once they were cooked, this enhanced the flavour and stopped them sticking together when stacked. Olga's recipe is available here. I tried my hand at cooking them on the night but definitely want to give them a try at home.They tasted amazing served with berries, jam, mint and creme fraiche. 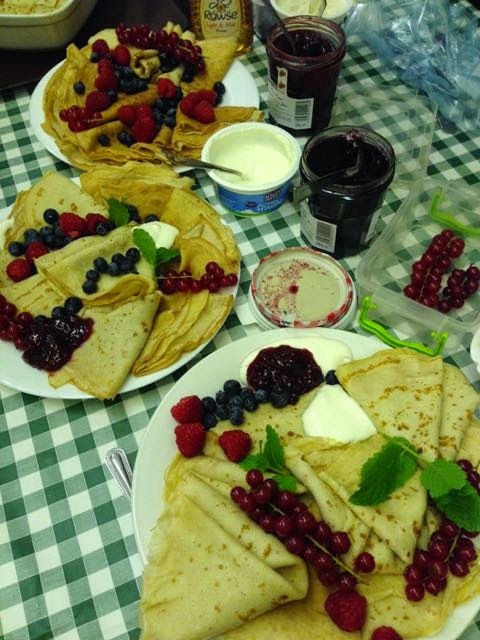 Much like our Shrove Tuesday they are traditionally made for Maslenitsa which is a Russian Festival preceding Lent. It is a celebration of the end of the winter chills and the start of Spring, of warmth, of hope, of growth. 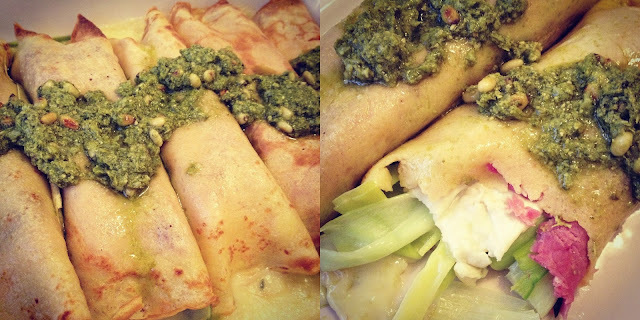 Given the choice I would tend to opt for savoury over sweet when it comes to crepes. Olga suggested mince and onion topped with creme fraiche, stir fried wild mushrooms, cheese, ham, smoked salmon and traditionally red caviar. I've got a delicious recipe courtesy of Marks & Spencer to share with you which would made a fantastic main meal on pancake day. I wouldn't have thought of using Camembert in a crepe but it worked really well. Just make sure you leave enough room for some sweet pancakes for desert. 3 Stir half the melted butter into the crêpe batter. Heat a non-stick 22cm diameter frying pan, and add a little of the remaining melted butter. Pour in a ladleful of the batter and swirl around to coat the base of the pan. 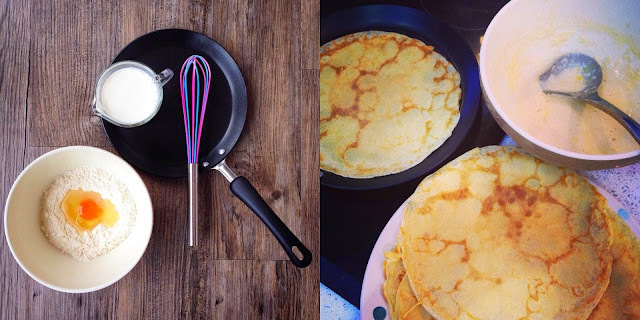 Cook for 1-2 minutes, until golden, then flip the crêpe over and cook for another minute. Transfer to a plate and keep warm. Repeat with the remaining batter to make 8 crêpes. 4 Place a slice of ham, a piece of cheese and 2 leeks on each crêpe, then roll up to enclose. Transfer to a baking sheet and place in the oven for 5 minutes to warm through. Drizzle over the pesto before serving. 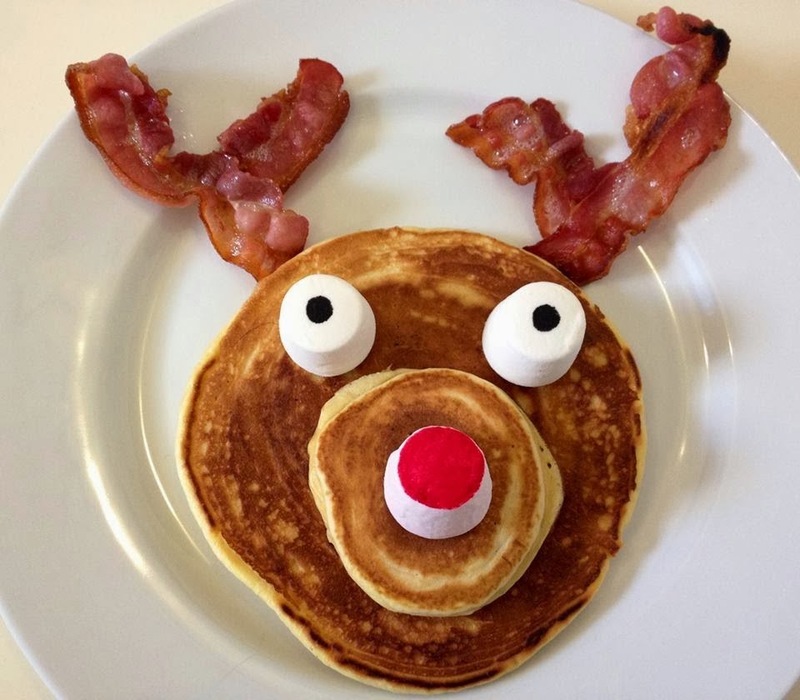 If more proof is required that pancakes are for life, not just for Shrove Tuesday, surely it comes from my Reindeer Pancakes?! Now to get to work on a birthday pancake creation as this year Pancake Day coincides with Foodie Loon's Birthday. It's going to have to be an enormous pancake to fit all those candles on. Disclaimer : M&S provided me with recipe ingredients and pancake sauces. Maple Moose provided Maple Butter. All views expressed are my own. What would be on YOUR ultimate Scottish Foodie Bucket List? 2015 is the Scottish Year of Food and Drink. The aim of the Year is to mark, highlight and promote Scotland’s abundant, quality produce to both locals and visitors. To kick off the celebrations Visit Scotland asked both the public and selected top chefs to come up with their must do/most memorable food experiences in Scotland. The final list covers the top picks of food & drink experiences in Scotland across the 15 regions. 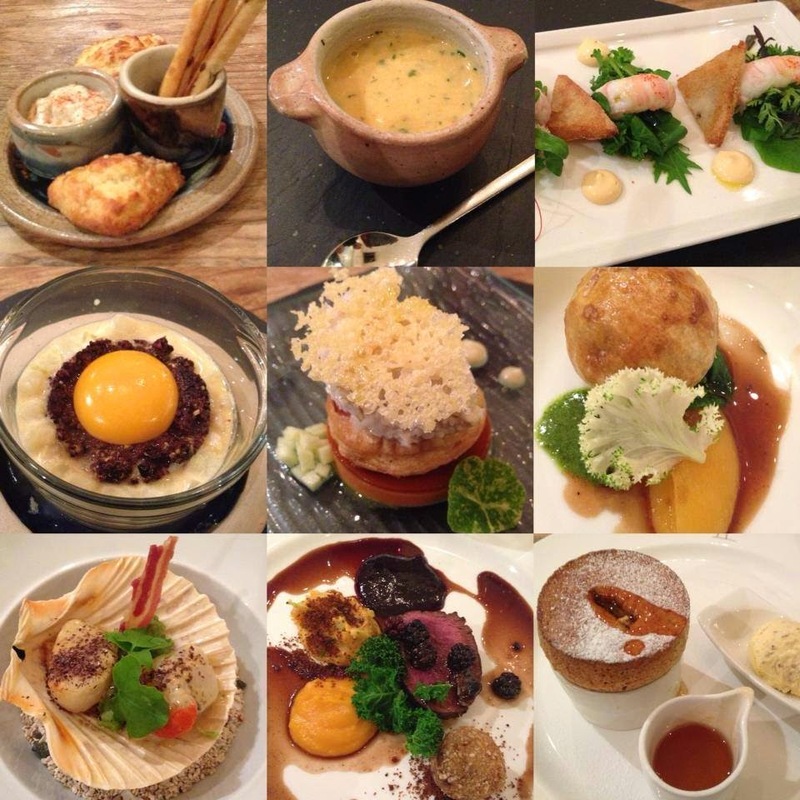 Could this be the ultimate Scottish Foodie Bucket List? That was exactly the question up for discusssion last week on BBC Radio Scotland Kitchen Cafe where I was a guest alongside chef Mark Greenaway. I've only managed to tick off 6 out of 15 on that particular list but I reckon others that I have experienced would be equally justified to make the cut. My own take on the subject is that the special foodie experiences that only Scotland can provide break down into two distinct categories. Back to basics/nature and luxury fine dining. At the basic end of the scale nothing can beat eating outdoors be it on a beach, the side of a loch or halfway up a mountain. At the top of the the scale I've enjoyed Afternoon Tea at Gleneagles Hotel and dined at Michelin starred Castle Terrace Resturant, Andrew Fairlie and The Three Chimneys. Still on my to do list are The Peat Inn, Kinloch Lodge and The Kitchin. Fish and Chips featured strongly among responses from the public. I've enjoyed them at the Anstruther Fish Bar, in a Lighthouse at Boddam, topped with Scallops in Gairloch, from the Van on Tobermory Harbour, on the wall at Ullapool Harbour, as a birthday lunch at The Bay in Stonehaven and on a Fish and Ships cruise round Aberdeen Harbour. Frankies Fish & Chips in Shetland remains on the to do list. There is something very special about eating them outdoors - and I don't mean being attacked by seagulls. 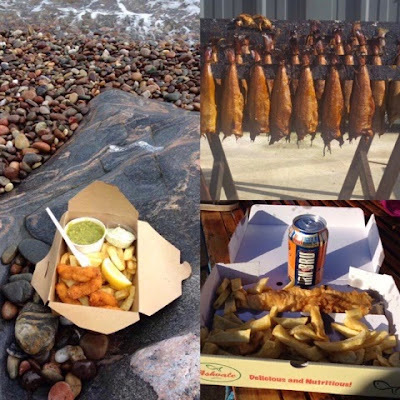 I've enjoyed the original and best Arbroath Smokies from Iain Spink. There is absolutely nothing like eating them straight from the barrel as the hessian is lifted and you are engulfed in pungent and eye watering smoke. Smoke of another form was present on another memorable foodie experience. 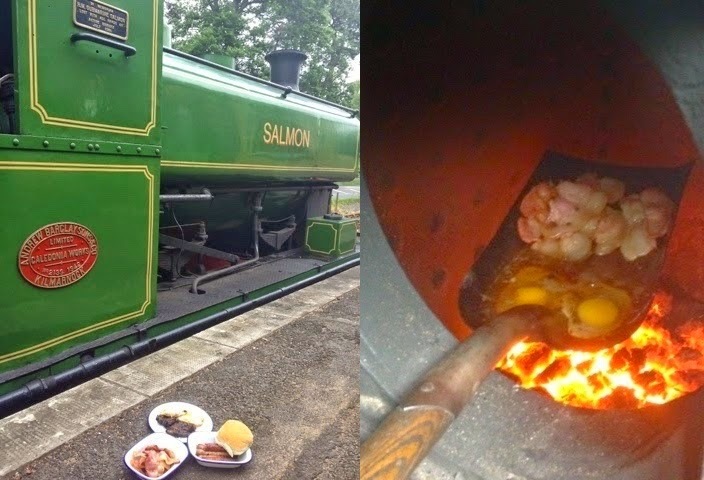 Cooking breakfast on the shovel of Salmon the Steam Engine at the Deeside Railway. A Footplate Fryup not to be forgotten, following in the footsteps of my my Great Grandfather who was Stationmaster at Redcastle Station on the Black Isle Line between 1913 and 1943. On the Scottish drink side of things I am somewhat embarrassed to say that I am not a whisky lover. As such, finding a whisky that I like is on the to do list. Apparently there is one for everybody out there. I have however found a Scottish Gin that I like. If truth be told I've found rather a lot. 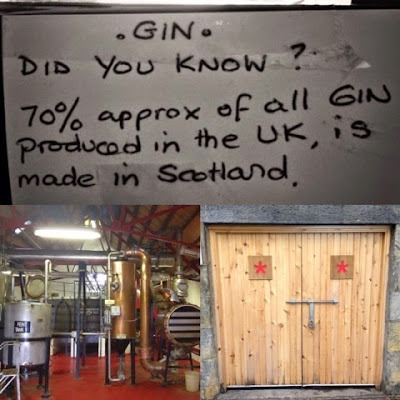 Over 70% of UK Gin production takes place in Scotland so its no real surprise. My visit to Caorunn definitely goes on my most memorable list. I've made some Gin infusions myself with rhubarb and brambles but making my own blend of Scottish Gin has still to be ticked off the list. I guess I foraged in my childhood but it didn't have a name then as such. I often went bramble and blaeberry picking with my granny and had the purple stained fingers and scratched arms to show for it. 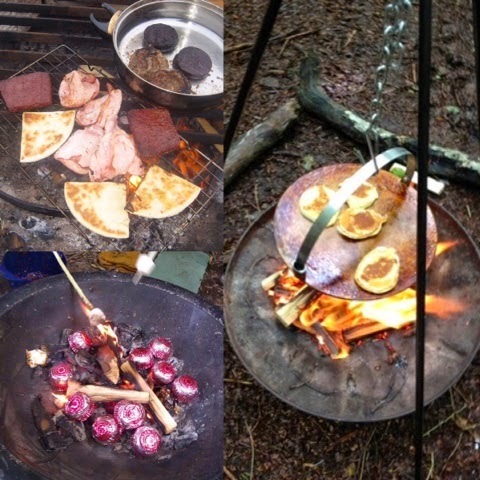 Over the last few years it's become more and more popular in foodie circles and I've loved learning from the experts and becoming more proficient myself in identifying and utilising what's out there free for the taking in Scotland's environment. Mark WIlliams of Galloway Wild Foods has been a huge inspiration to me along with Fi Bird and Rosie of Wild Rose Escapes. I've foraged for and eaten everything from fungi to seaweed and tried to pass the passion on via my family foraging and outdoor events with Mud Pie Adventures. One challenge remains. Spoot Clams. Would love to lure some of them out of the sand with salt. So what's left on my to do list? Apart from those I've already mentioned it pretty much comes down to Hunting, Shooting & Fishing and visiting more producers and places. Firstly, catching cooking and eating a fish on a riverbank. I've made an attempt at salmon fishing on the River Dee but alas no bite. Even if I had actually caught something it would've had to be thrown back. However when I posted on my Foodie Quine Facebook Page a friend came up with an offer. A spot of sea fishing for Mackerel or Coley followed by a BBQ on the beach with aioli, crusty bread and a squeeze of fresh lemon. Roll on summer! My knowledge of hunting and shooting goes only as far as attending the Highland Field Sports Fair throughout my childhood. I've never even shot a clay pigeon! Really don't have a clue where to start with this one but I do love to eat game so it would be fantastic to follow the journey to the plate. There are so many wonderful foodie places that I've yet to discover in Scotland. 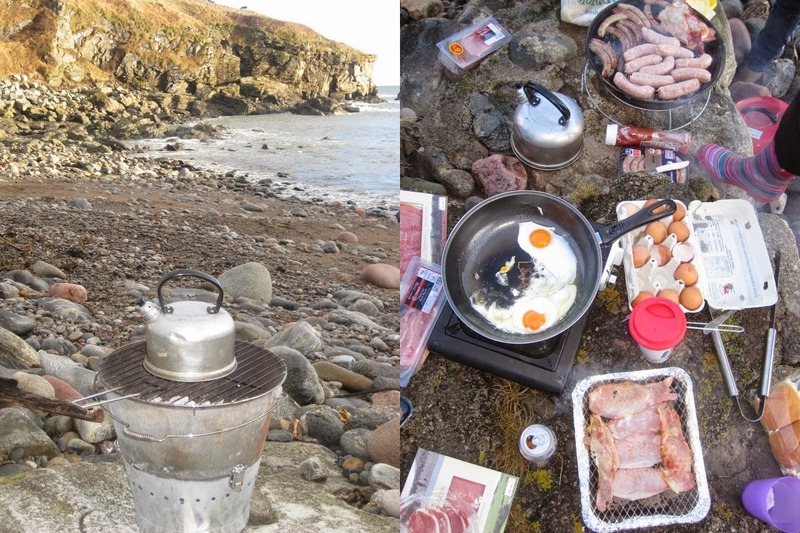 Shetland is right up there on my list thanks to the UK's most northerly food blogger Elizabeths Kitchen Diary. I'd also love to make it to the Western Isles. I didn't even know that Scotland had a designated food town until I got to number 9 on the list. Castle Douglas is now on my list. 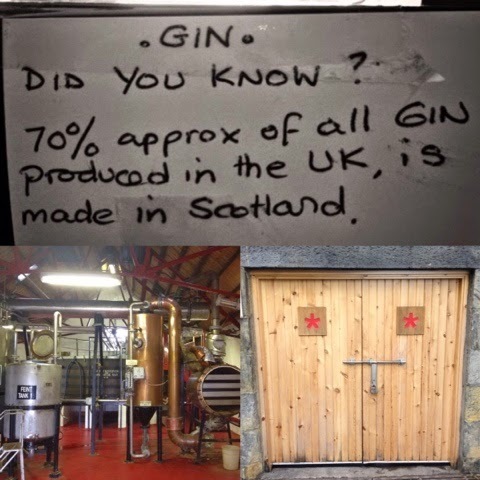 I'd also love to visit some iconic Scottish producers. In true Play School style how fab would it be to go through the round window to see Haggis, Shortbread, Butteries, Irn Bru or Tunnocks Teacakes being made! I'd love to know what's on your list. Please do comment below and tell me. Is there anything that I've missed? Or selfishly could you help me fulfill one of my bucket list items in this year of food & drink? Whether you are feeling slushy and romantic with a special someone or simply love good food, I've got some seasonal Valentines ideas to share. Firstly the fun ones. I've made all of these over the past few years. My husband is indeed a very lucky man. More quirky and cute than outright romantic. Fruity messages included: I love you Berry Berry much, I'm going Bananas over you, Orange you glad you're my Valentine, We make the perfect Pear and You're the Apple of my Eye. 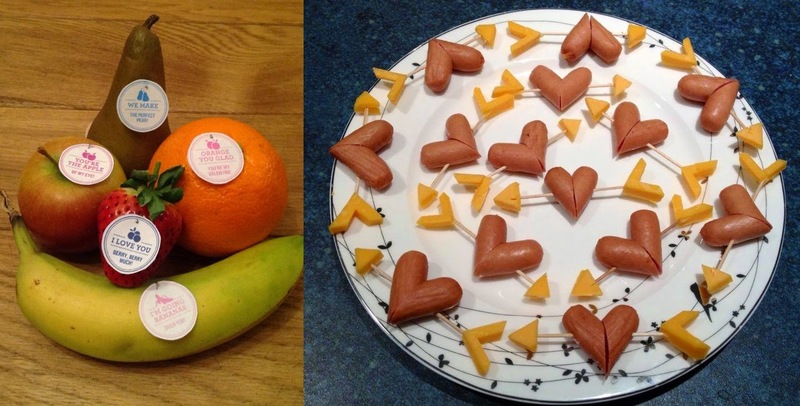 Next up - Hotdog and Cheese Hearts. Nothing quite says true love like processed meat. Brie My Valentine was last year's sentiment stamped out with alphabet cookie cutters on heart shaped brie. Carefully sliced Cherry Tomatoes combine to make the perfect love heart. Romance and one of your five a day. 2015 is the Scottish Year of Food and Drink. The aim of the Year is to mark, highlight and promote Scotland’s abundant, quality produce to both locals and visitors. Each month has a different theme. February is of course "Food of Love". Looking forward to March, the theme is Brewing and Distilling. That gives two whole months to enjoy the recently launched Love.Gin from Eden Mill Distillery and Brewery in St Andrews. Limited edition of only 2,400 bottles. Available online and from specialist bottle shops. And the verdict? It's lurvely! Very mellow and easily drinkable. Slightly fruity - think berries/rhubarb. Went down very easily. Problem with the solid bottle is that you can't see how much (or how little!) is left! Key Botanicals - Juniper, coriander, angelica root, Hibiscus, Rose petal, Elderberry, Rhubarb Root, Marshmallow root, Goji Berry, Raspberry leaf. Nose - Soft subtle juniper on the nose, touch of warm spiced berries - strawberry, raspberry. Sweet vanilla and green fruits - green apple and pears. Finishing with very delicate citrus pink grapefruit and drop of rose water at the very end. If the forced romanticism of a eating out on Valentine's Day isn't for you, why not cook up a storm at home? I've got a delicious recipe courtesy of Marks & Spenser to share with you. We enjoyed it as a romantic family meal for four. Long gone are the days of dining a deux. Wonderful flavours, looks very impressive but is actually very straightforward to make. I can definitely see me adding the baked plums with star annise, port and soy sauce to other dishes and the fried ginger matchsticks which were sprinkled on top provided a real kick to the tastebuds. Light on calories too. Heat the oven to 190 degrees Celsius / 375 degrees Fahrenheit / gas 5 (170 degrees Celsius for fan ovens). In a small, ovenproof frying pan, heat 1tbsp of the oil. Season the duck breasts and fry for 2 – 3 minutes each side, until starting to brown. Transfer to the oven for a further 15 minutes, then remove and set aside. Meanwhile, sit the plums, cut side-up, in a small roasting tin with the star anise. Drizzle over the port and soy sauce. Roast for 10 – 15 minutes, adding a splash of water to the tin if it becomes dry. Set aside. Cook the noodles according to packet instructions, then drain and refresh under cold water. Heat the remaining oil in a small frying pan and fry the ginger for 2 minutes, until golden. Drain on kitchen paper. Toss the noodles with the herbs and rocket. Divide among 4 serving plates and add the plums. Slice the duck breasts and arrange on top with the fried ginger, then spoon over any pan juices from the plums. 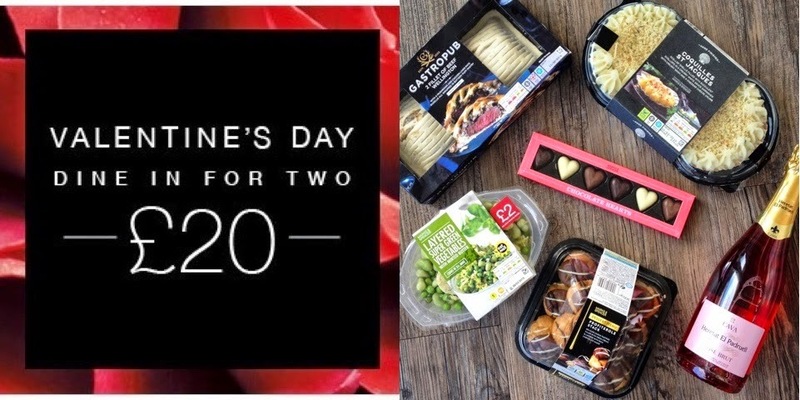 If cooking from scratch is a step too far its definitely not a cop out to go for a M&S Valentine's Day Dine in for Two deal. #Valendinein This offer runs from 11th - 16th February and includes Starter, Main, Side, Desert, Plonk and Choccies. I honestly couldn't fault our meal, tasty, decadent and fantastic value for money. Only problem is knowing what to choose from all that's available. We opted for Coquilles St Jacques, Fillet of Beef Wellington, Pea, bean & Veg Layer, Posh Profiterole Stack, Cava Rosado and Chocolates. The full listing of items included in the offer is available here. I think we might have to do it all over again before the 16th. I'm going to end with an other food and love quote. This one comes from the inimitable Dolly Parton. "My weaknesses have always been food and men—in that order." Disclaimer : M&S provided me with a £20 Valentine Meal Deal and recipe ingredients. 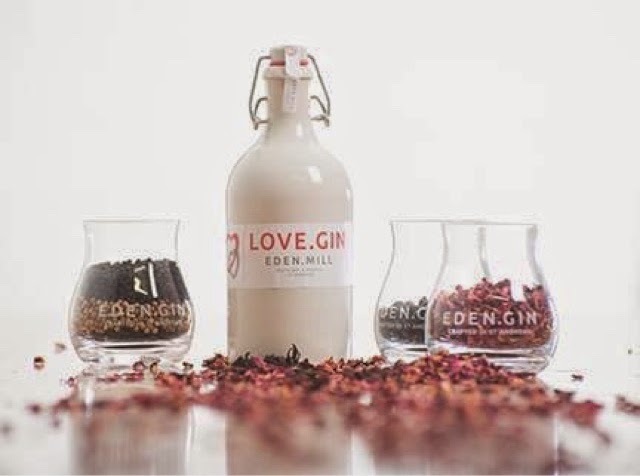 Eden Mill provided a bottle of Love.Gin. All views expressed are my own.